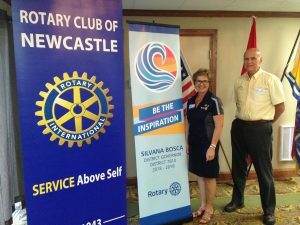 The Newcastle Rotary Club welcomed Silvana Bosca to our club meeting the first week in July. Silvana is the District 7810 Governor for the 2018-19 Rotary Year, and is from the Bathurst club. This is the second year in a row the incoming District Governor has chosen Newcastle as their first stop while visiting clubs through New Brunswick and northern Maine. Silvana brought greetings from the Rotary International President, and discussed her goals, as well as our club goals for the coming year, while passing along many tips to assist us in our activities. We look forward to working with Silvana through the coming year. District Governor Silvana was thanked by Rotarian Rob MacTavish.